Today, I went into the Streets of Madrid Looking for its Character. I chose the wrong time of year to do this. August in the centre of Madrid is quiet in comparison to the rest of the year. Nevertheless, I was sure that Madrid shouldnt have just disappeared and become a ghost town. After living in Madrid for more than 18 months I know that it does have Character. A character that is different to many cities and towns in Spain. Ive seen it and Ive felt it. Its something you have to go looking for and its difficult to explain it to other people. Looking at the Monuments tells me something about Madrids History but I tend to find a citys real identity in the type of people who live in its dwellings and occupy its streets. Taking a Metro to Callao in Gran Vía, the main commercial street in the city centre, I walked out into the plaza and then stood looking at the people on the street. I had a camera with me and had hoped to be able to encounter situations where human emotion was present. A crying child whose world has collapsed because of a dropped ice-cream or a Saturday afternoon drinker who had had too much drink already and is stumbling out of doorway, blinking into the brightness of an August sun. Or, a family enjoying the fresh air on a park bench together. No work to disrupt their Oneness on a Saturday, functioning as a real Spanish family does. Living outside. I didnt really see this. I saw that the city was empty for a Saturday afternoon and that the only really active people on the streets were probably tourists. I headed down hill towards Plaza de España and hoped to meet throngs of tourists and locals enjoying the sun. The Plaza is airy and clean-looking. A broad space without many occupants to litter it. Its too hot to spend more than a few minutes walking across the Plaza de España taking photos. I manage to snap three lads who have decided to sit in the fountain and drink fizzy drinks. I take a photo and walk on. 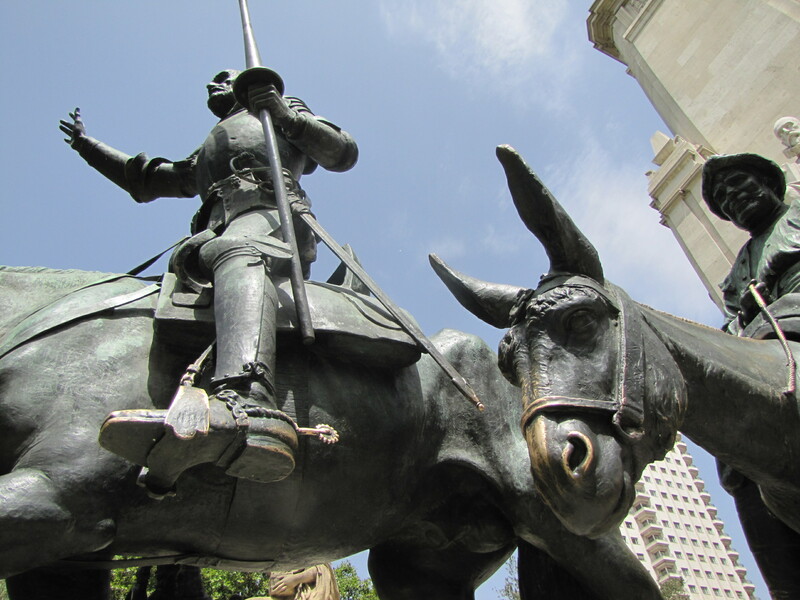 Normally the large Statue of Don Quixote and his companion is blotted out with tourists of all nationalities hanging on to his horse or adorning the composition with their own figure while a spouse takes a mobile phone snap shot. Funny how people still dont think much about their photo compositions. A very large statue of Don Quixote with your partner leaning against the Dons foot in stirrup means taking a few steps back to get everything into the shot, back a bit, a bit more and click. Great photo. And who is that person in red being dwarfed by the giant statue, damn, shouldve got closer because I cant make out her face. The folks back home will have to just believe its her and not some stranger. Today, the statue was easy to photograph. Minimal visual distortion caused by tourists. No queues to wait in to get your turn for a quick snap-shot with Don Quixotes foot in your ear. 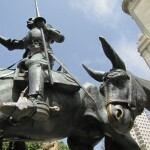 Don Quixote was a dreamer and believer of greatness. He knew that the World was full of fantastic things and of great battles that he could fight. If only he could locate them and become involved he would then redeem himself and been seen as a Great man who feared nought. I did see some locals enjoying the shade around the edges of the Plaza de España. As a plaza, I think its a good design as a functional place to relax. If you want to get scorched in the sun just sit in the middle and get sunstroke. If you have been shopping in Gran Vía, then you can easily find a place to sit down and relax in the shade along one of the small pathways on the perimeter of the Plaza. The benches are nice and long so sitting on the same bench as a stranger is no invasion of privacy. I walked to the far side so that I could see Don Quixote silhouetted against the tall composition of buildings in front of the Plaza de España. I think these boxy structures that you see in Gran Vía, with many small windows and a form that pyramid up to the sky create a unique atmosphere in Madrid. They often remind me of the sort of building that can be used to create a feeling of dread or dominance in a film. Teléfonicas building is a good example just think Ghost-Busters when you look at it. I walked out of the Plaza and headed up towards the Royal Palace which is a real tourist trap with its Gardens and street entertainers. By this time I was really thinking about Madrid and its Character. Where could I find something on the street that would be undoubtedly Madrileño? The palace looked silent and unused today. People were walking past without a second look, me too, I had my camera but the bleached walls of the large palace didnt beckon as much as simple patch of green does on a hot summer day. Three young women were sprawled out on a patch of green grass shaded by two low trees. They were making a lot of noise for people who want to relax. Their seemed to be some dispute about a bag that was empty. One of the girls lifted a towel into the air and waved it around, then I heard an excited American voice complain to the other two who were prone and leaning on their elbows. One of them stared at her complaining companion and then as her mouth dropped open she gasped in disbelief at her friends accusations. A spat followed and then luckily I was out of earshot to hear anymore. I walked into the small park and admired the statues of various Kings and Queens. In the middle of the park I saw a central statue that was of obvious importance. 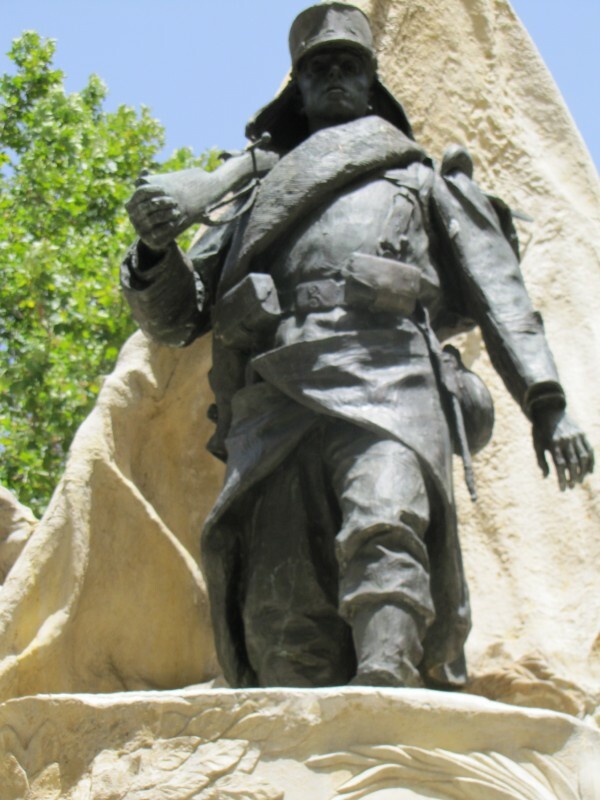 From a distance it was clear that it was of a Legionnaire from the Moroccan Campaign of 1887-1909. Interesting, the Legionnaires of the war had a very bad reputation for being extremely brutal and sadistic. Why would anybody think of honouring one of these men. I walked over to it and read the plaque next to it. This was obviously a good guy who had put himself in the line of fire to save his comrades. 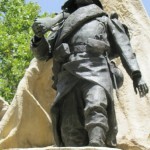 The statue was commissioned by the Women of Madrid in honour of a selfless Soldier. The statue is worth contemplation both because of its form and expression and the fact that it represents the idea of a single selfless act of a human being who made a difficult decision to lose his own life to save the lives of others. I began to think about the Legion. 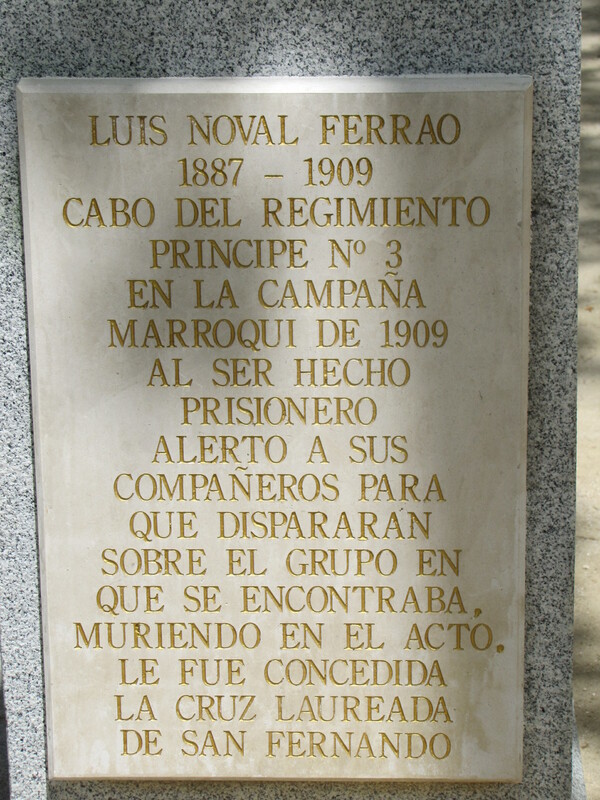 The Spanish Legion was similar to the French Foreign Legion in the sense that it recruited Foreigners. The Spanish allowed some Spaniards to enter if their skills were needed. Mainly it consisted of Moroccan recruits. 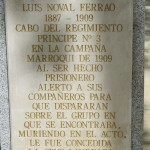 During the Civil War they were under the command of Franco himself. The French only allow French to serve at the level of officer in the Legion. They are called Legionnaire not private soldier or private 1st class etc. They would join and become a part of a large force where their own identity no longer mattered. They could disappear into the ranks of the Legion and not be heard of again. Often was the case. I am impresses by this Legionnaire. He had honour and maybe he took part in bloody battles that we would rather not think of, but in the end he made a sacrifice that only others can talk about and remember him for. A man of great honour. I walked on across the grass and headed towards the plaza opposite the Palace. I passed a bench where a family were sitting. The father was changing his sons nappy as the mother folded a blanket on the grass. The baby was red-faced and crying, the father was struggling to stay calm and ignore the cries of the little blighter. It was hot and they had decided that enough was enough and its no fun any more. I felt a photo would be too intrusive and irritating in a private moment between father and son. By now, I was very hot and in need of a drink. I told myself that I should stay clear of a bar as I might end up staying too long. Madrid bars are easy places to meet somebody on a Saturday afternoon and to become caught up in a discussion with strangers about nothing much. Just a nice thing to do but a waste of a Saturday afternoon. I headed towards home in Palos de las Fronteras. On the way I passed through Calle Lion and then stopped on the Plaza Anton Martin. There is a large modern statue of people who appear to be lurching forwards in a violent manner. I read the plaque under the statue. Atocha 55, an office across the street in Calle Atocha which is boarded up and I believe it has been for many years. In 1977, 18 months after the death of Franco, several lawyers and a Union official met in the office in order to draw up documents for a liberal union and better working conditions. They had only just arrived and it was early Morning as they got coffee and prepared for the meeting. A short while later the doors of the office were forced open and three men entered with weapons. The assassins sprayed bullets around the office and when they were sure that they had killed everybody, they left. Two people survived but the lawyer and the unionist were killed along with other co-workers present. The statue outside on the street represents the memory of those people and the sacrifice that they made for their beliefs in change and a New Democracy. Today, there are still union meetings where the members will take a few minutes of silence to remember the Atocha Lawyers. Trying to put your finger on the Character of Madrid is difficult. Madrileños are hard-working people who know how to enjoy life when the work is done. The nickname of the Madrileños is Los GatosThe Cats. Like real cats, Madrileños love the night and all it has to offer. The city is vibrant with cheer and the bars stay open till dropping out time. The name comes from wars past and the fighting spirit of the Madrileños when faced with situations that most would baulk at. Madrileños may today claim to be a mixed populace that is hard to define but its spirit is still intact.